The Big Game Hunter CrossDraw Holster and Gun Belt is a western style hunting holster, hand carved from premium Grade A 8-9oz cowhide and fully lined with 4-5oz smooth face cowhide. This fully lined high quality hunting rig is custom made for the hunter who wants a tough belt to stand up for years of aggressive use and to be able to pass along with pride. The Big Game Hunter Gun Belt is 3" wide, with 6 rifle rounds and 6 pistol rounds hand laced wet and dry molded and off-set to your strong arm side to allow additional slide-on gun belt accessories and won't interfere while carrying your rifle over your shoulder. 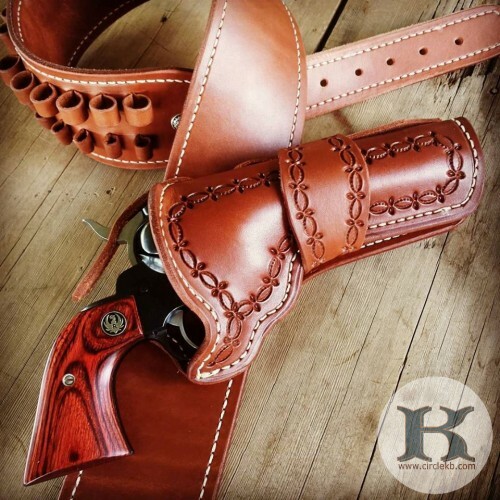 The CrossDraw holster is especially fitted for a safe and secure fit in case you are riding horseback, four wheeling or boating, hiking, kneeling or crawling. Holster may be ordered plain, border tooled or full basketweave. Satisfaction fully guaranteed.